Providing you the best range of edge protector, polycoated & moisture resistant edge protector and paper edge protector with effective & timely delivery. 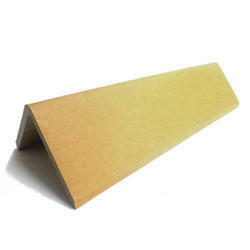 Clients can avail the offered range of Edge Protector from us. The offered protector is manufactured using basic raw material and advanced technology, in compliance with set industrial standards. This protector is used for preventing edges of appliances from several damages while transporting. We offer this protector in various customized options and deliver it within a set time - frame. Our offered protector is highly demanded by our clients due to its hardness and easy installation. 30mm x 30mm, 35mm x 35mm, 40mm x 40mm, 50mm x 50mm, 60mm x 60mm, 65mm x 65mm, 75mm x 75mm, 100mm x 100mm. Air- conditioners, medical equipment, refrigerators etc. 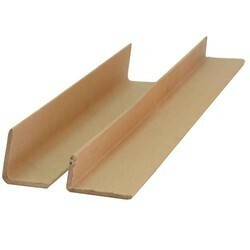 Providing greater 'structural strength' to corrugated cardboard cartons being used for consumer durables like washing machines, water coolers, computers, televisions, audio music systems etc. As a cost-effective protection method for fragile products like sanitary ware glassware, decorative articles, artifacts, lighting products, fittings etc. As an economical and effective secondary packaging and too expensive industrial products like telecom equipment panel boards, instrumentation circuits, computer systems etc. Edge protection to bulk products like aluminum coils and steel coils etc. Inner diameter protection from the bulk handling method like slinging through the eye for products. Like hot rolled steel coils, cold rolled high-value items like silicon steels, cargo coils etc. We offer Polycoated & Moisture Resistant Edge Protector, Corner Boards and dia protectors. 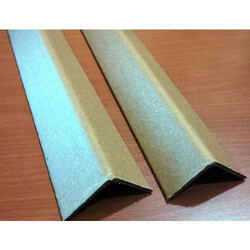 We offer Paper Edge Protector. 30mm x 30mm, 40mm x 40mm, 45mm x 45mm, 50mm x 50mm, 60mm x 60mm, 65mm x 65mm, 75mm x 75mm, 90mm x 90mm, 100 x 100mm. The thickness is from 2.5mm to 10mm.